Getting your script to film requires more than just a good writer. An exceptional storyboard artist will help you visualize your ideas and make sure that you know exactly what things will look like before you commit to the time and expense of filming. From simple sketches to fully inked panels, our story board artists will help you to “see your script”. Need your boards done in a specific style? No problem. Simply provide us with a sample of what you want them to look like and one of our talented illustrators will make sure the visuals are what you wanted. Not sure what you want? We would be happy to provide you with various examples and discuss your specific needs to make sure you are thrilled with the end product. 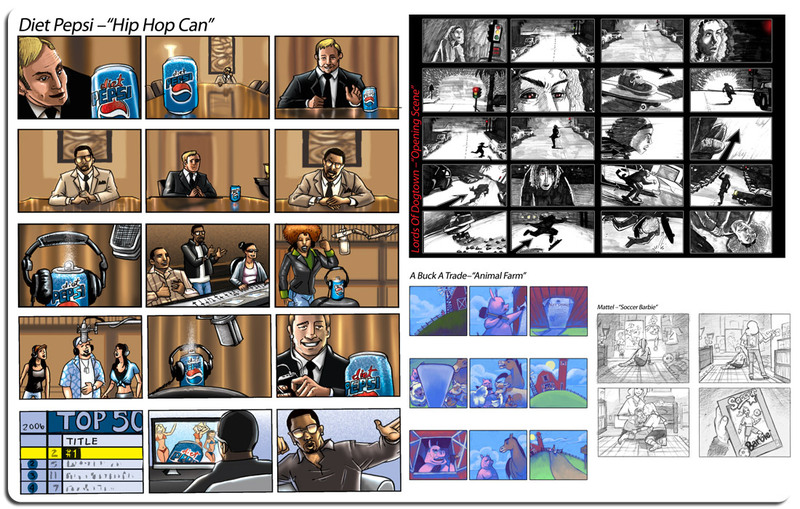 Storyboards are another example of how Modul8tion can save you money. It’s so much easier and less expensive to make changes before your production crew is set up ready to film or record. Good storyboards can show you where you need to make changes before the crew is on the clock. Storyboards will also help your shoot to run more smoothly as they serve as visual cues which can be referred to in order to keep things moving along. They will make the director’s life easier and ensure that your final product is exactly what you wanted. Our extensive background in sequential arts greatly enhances our storyboards. We know how to convey the dialog, emotions and timing using only pictures. And with our talented team of artists and our years of experience, we are one of the best in the business. Call us with your next storyboarding project. You won’t be disappointed.